At a time when medical care for the people of the United States is undergoing wrenching change due mainly to vast and costly technological progress, doctors have had to cede much of their initiative and responsibility to third parties. Medicine has become a commercial enterprise. Patients must affiliate themselves with a managed health care organization in order to have access to their doctors. In the hurly-burly of today's techno-medicine, many physicians are too busy to spend time in dialogue with their patients. As a consequence, social and emotional circumstances that have been thoroughly documented to affect physiology and susceptibility to disease are overlooked. Stewart Wolf here critiques the medical establishment and the way those concerned with its various responsibilities discharge them. He puts medicine's responsibilities to society into historical perspective, relating it to social changes. He begins with the ways medical candidates are selected. He continues with commentary on currently designed teaching and learning, the qualities required in a physician and in a medical scientist, and the nature and challenges of disease and what can be done about them. Finally, Wolf provides a useful way of thinking about human biology, to better understand why people become sick or well and what people have to contend with to stay well. Throughout he emphasizes the role of the brain in controlling behavior of all sorts, general and visceral. Wolf emphasizes the regulatory power of the nervous system as it perceives and evaluates life experiences and influences learning, behavior, and susceptibility to disease. Wolf'sgoal is not to supply a recipe for the achievement of better health, but to encourage a better understanding of ourselves and the paths toward health. 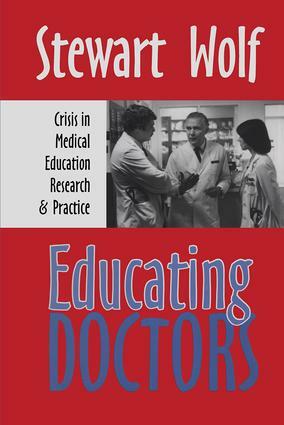 Educating Doctors reexamines the responsibilities, goals, and activities of the medical establishment. As such it is a must read for policymakers, sociologists, and professionals working in the medical field.